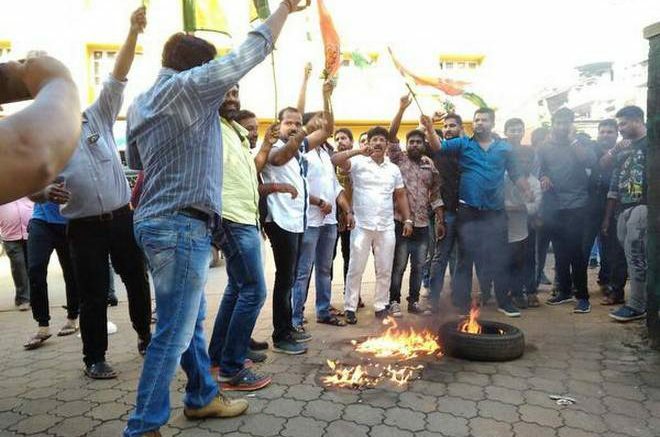 Members of the Youth Congress, led by Mangaluru City Corporation councillor A.C. Vinayraj, on Wednesday vandalised the office premises of the Income Tax Department in Mangaluru. Protesting against the IT raids on Congress leader and Energy Minister D.K. Shivakumar, the members attempted to set tyres on fire in front of the Central Revenue Buildings housing the Income Tax offices at Attavar in the city. When the police prevented them from doing so, they tried to enter the office premises. As the doors were closed, the members tried to gain entry by kicking at the glass panes, which gave way, said Mangaluru South Police Inspector K.U. Belliappa. Addressing the cadres, Mr. Vinayraj accused the Bharatiya Janata Party of indulging in horse trading to form governments in small States. Now the party is indulging in a similar practice in Gujarat where the Rajya Sabha elections are scheduled, he alleged. When Gujarat Congress MLAs are kept at a safe place in Karnataka, the BJP is misusing the IT Department to its advantage, the councillor said. The members were dispersed by the police later. No one has been arrested so far. The police have registered a case on the basis of a complaint from a woman Sub-Inspector of Police, while a formal complaint is awaited from the Income Tax Department officials, said Deputy Commissioner of Police (Crime and Traffic) Hanumantharaya. 1 Comment on "Members of the Youth Congress vandalise IT office"
Congress has lost the plot. By vandalizing they can’t win votes.